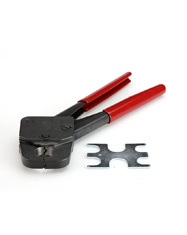 CB Supplies carries North American made PEX crimp insert tools ranging from 3/8″ through 1″ diameters. These quality tools are designed for PEX potable water and hydronic heating systems. Each tool comes complete with a Go/No Go Gauge and detailed instructions on use and care.